On August 6, 2015, it was seventy years since the bombing of Hiroshima. I had visited the city in March 2014, and decided to do a whole week of posts about Hiroshima, a great city. I found Hiroshima to be one of my favorite cities in Japan. Not too big like Tokyo, but still with a lively and vibrant nightlife. Not quiet like Fukuoka. It had great restaurants, plenty to see, and the Peace Memorial Museum was an emotional experience. The food there is also very good. Okonomiyaki, the local speciality, has to be tried when visiting the city. The city is easily reached by the shinkansen (bullet train). The fastest train, the Nozomi, takes about four hours from Tokyo. Post 1: The City and the Bomb. 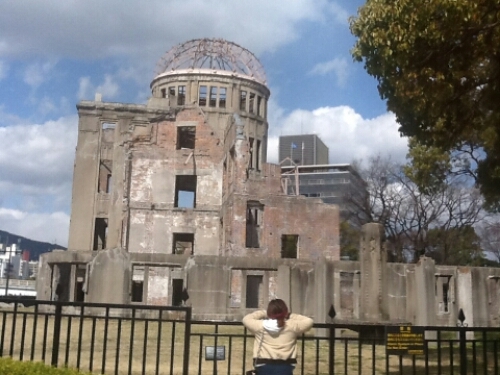 Post 2: Genbaku (A-bomb) Dome. Post 3: The Peace Memorial Museum. Post 5: A Cathedral in Japan. Post 6: Okonomiyaki, the local speciality. 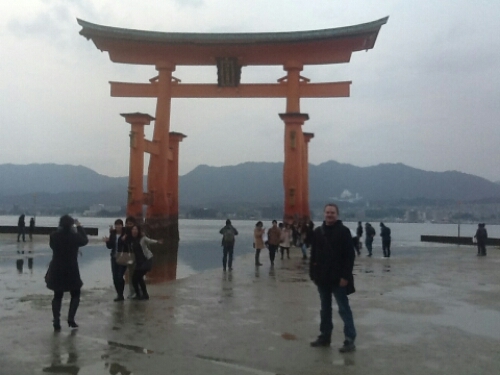 If you are in Hiroshima, I strongly recommend visiting Miyajima as well. An island with a famous shrine and great tasting oysters. It is only an hour away and well worth a visit. There is also a cable-car there which takes you up the mountain for a great view of Hiroshima Bay. Just remember it stops operating at five p.m. So get there earlier. In my posts I have decised to focus on the actual bombing of Hiroshima. Whether or not the bombing was justified, and whether it actually saved lives in the end or not I leave to the experts to decide. My focus has been on Hiroshima. if you are interested in the A-bomb and the bombing, I suggest this book by Paul Ham which studies the subject in depth. for more information about this great city, visit the prefectures official Tourist Site.